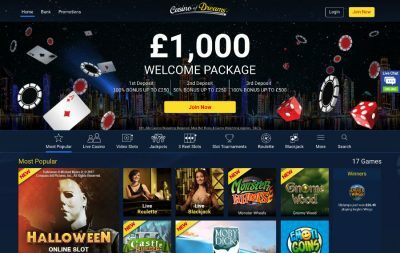 With a hefty *£1,000 welcome package and a good range of available games, Casino of Dreams shows some promise as a good casino at which to play. So far, so good. But does Casino of Dreams deliver as an overall package or will it give you nightmares? Find out as we delve into the finer details of this relatively new casino. 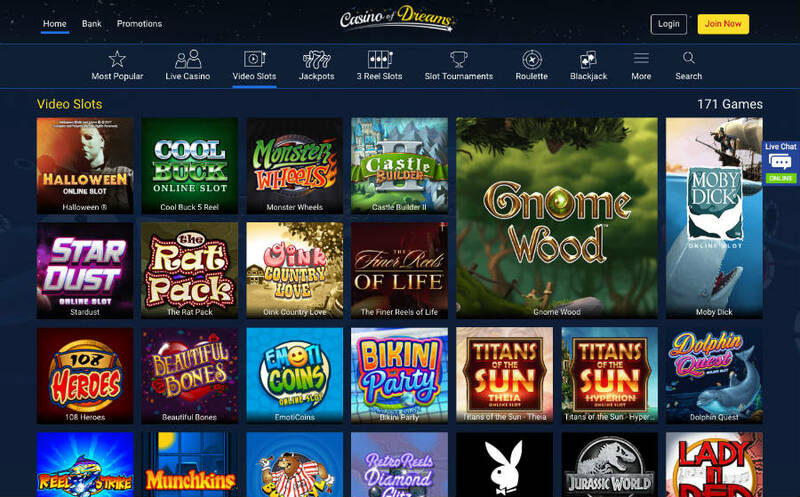 The approach of Casino of Dreams is very much functionality over fancy graphics. You won’t find any confusing animations or particularly innovative designs here. Instead, you’ll get a site which makes everything easy to find and looks reasonably nice in the process. The upper area of the site has a 3D-like graphic and details of the latest offer. This is relatively nicely designed and doesn’t detract from the actual games, although we have seen designs like this executed slightly better. The mobile compatibility of the site is fairly good; you can tell it was a big consideration for the team when they pulled the site together. The layout is essentially the same as on desktop but the game categories are scrollable with sideways swipes, and the game icons have been resized to fit nicely in a grid that adapts to the size of your screen. The varying bonus amounts on each deposit won’t matter if you are depositing less than £250 each time. However, if you tend to deposit amounts larger than £250, it’s worth paying close attention to the bonuses and structuring your deposits in a way which maximizes your bonus cash (i.e. save your biggest amount for the third deposit). To get the full *£1,000 bonus, you’ll need to deposit £1,250, made up of £250 on your first deposit, then £500 on your second and third deposits. In addition to the welcome bonus, there is a ‘Daily Deal’ bonus. 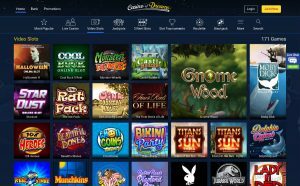 This is activated for 7 days after you deposit at least £20 and allows you to choose one of tree mystery gifts each day with prizes that include free spins and both deposit and no deposit bonuses. You’ll also earn loyalty points every time you wager money on a game. Every 500 points you earn are worth £5 in bonus money. Be aware though that all bonuses (including the welcome bonus) come with a 40x wagering requirement before it can be withdrawn, which is a little on the high side. 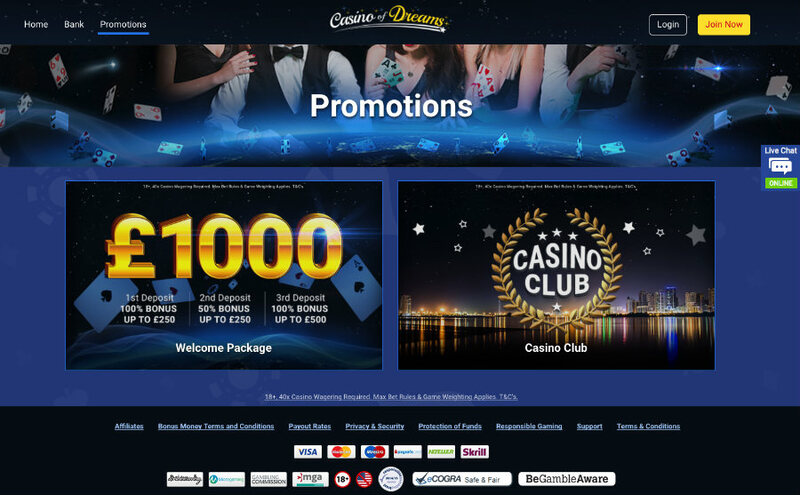 The range of payment methods available on Casino of Dreams is not the largest we have seen, but it does cover all of the main methods you would expect. Credit/debit cards such as Visa, Mastercard, and Maestro are accepted alongside e-wallets such as Paysafecard, Neteller, and Skrill. Note that the Paysafecard only allows deposits though, when you wish to withdraw you’ll have to use a different method. There is a low minimum deposit of just £10, but watch out as the minimum withdrawal amount is twice that at £20. In most cases that will not be an issue but it does mean if you only deposit £10, you’ll either need to double your money or make a further deposit to reach the minimum withdrawal amount. 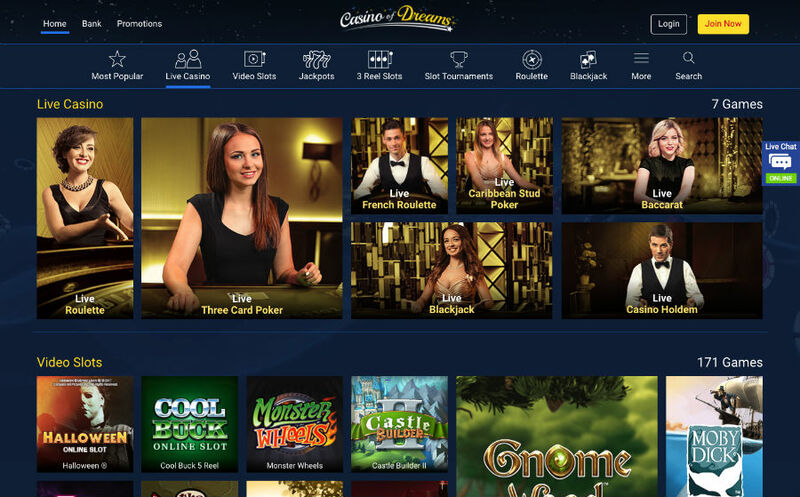 Casino of Dreams is powered by Microgaming, one of the best software providers around and so there are a range of high-quality games available. In fact, at the time of writing, there are over 250 games available. 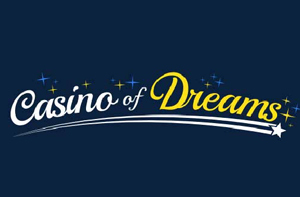 Perhaps the best-known game on Casino of Dreams is the multi-million jackpot slot Mega Moolah. 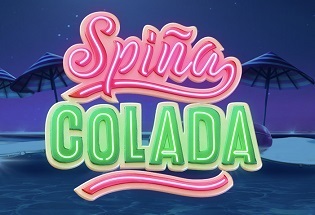 It’s a game with a cult following as it regularly pays out some of the largest progressive jackpots, including the second highest ever at £13.2m. Other slot games you can enjoy at this casino include the likes of Thunderstruck 2, Hellboy, Bar Bar Black Sheep, and Tomb Raider. We are also pleased to see a range of more traditional 3-reel slots on offer including old favourites such as Rock the Boat and Cosmic Cat. In terms of table games, there are several variations of blackjack, roulette and video poker alongside more casual games such as Keno, Red Dog, and Sic Bo. 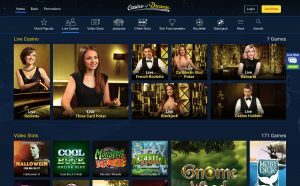 If you prefer the thrill of a live dealer, there are seven live casino games currently offer including roulette, baccarat, and three card poker. Casino of Dreams is an all-round quality casino. A good range of games is complimented by a very generous welcome bonus. You’ll find the site easy to use no matter what type of device you are using and help is only a click away thanks to 24/7 live chat and email. While the payment methods are not quite as plentiful as some casinos, there is still enough to satisfy most people, although the minimum withdrawal being twice that of the minimum deposit may put off some players with smaller budgets. Although Casino of Dreams doesn’t offer anything spectacularly different, there’s not much that should worry you either, meaning if you decide to play here you should still be able to sleep soundly at night. 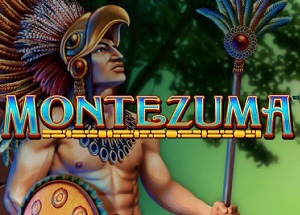 * 18+, 40x casino wagering required before withdrawal (game weighting applies), 2 day expiry for free spins, Max bet 6.25 until wagering requirement completed, T&Cs apply, New players only, Min deposit £10.